Reading the headlines, you would be forgiven for thinking that the recent Swedish general election had been a sweeping victory for the far right. “Chilling rise of the far right in Sweden”, reads a typically ominous example. But the gains made by the right-wing Sweden Democrats were neither decisive nor the harbinger of catastrophe. Within Sweden’s enviable democratic system, they reflect grievances held by small but significant sections of society - grievances that politicians of all parties must now respond to. To put the Sweden Democrats’ performance into perspective, they received 17.5% of the vote, representing a gain of 4.6% on their 2014 election result. This puts them in third place, behind the more popular but rather less titillating “Moderate Party”. Looking at the numbers rather than the headlines, around one in six Swedish voters were inspired, concerned or angry enough to vote for a party seen as being outside the mainstream political establishment. In the UK, the voting system would simply tell such people to shut up and go away. Amazingly, this is sold as one of the benefits of our First Past the Post system by its advocates - allowing, for example, that 13% of the popular vote elected just one UKIP MP in 2015. This means the concerns of these voters can be safely ignored by the political establishment even as they fester and grow… at least until an important referendum comes along, or someone with extreme views seizes the leadership of an established party. But Sweden takes a more democratic approach. Instead of telling unhappy voters to get lost, those voters are proportionally represented in the Riksdag just like anyone else. Politicians from all parties will respond in different ways. Some will do more to ensure no community is left behind, some will prioritise integration of recent immigrants, some will call for stricter limits on immigration. But they will all have to take these voters’ concerns seriously because all the voters will rightly have a fair say at the next election. This is why a recent paper from the Centre for Economic Studies found that a one-seat increase in representation for an anti-immigration party actually turns out to substantially decrease negative attitudes towards immigration. As the paper concludes, “Political representation can cause an attitudinal backlash as fringe parties and their ideas are placed under closer scrutiny”. As some say, sunlight is the best disinfectant. You don’t win people back to your way of thinking by ignoring them. Perhaps even more importantly, Sweden’s enviable democratic system puts it at extremely low risk of its democracy being eroded, in comparison to some other developed nations, including our own. There is a narrative among commentators in the west about the attack on liberal democracy across Europe by far-right parties. This narrative generally doesn’t distinguish between proportional and disproportional parliaments, but it should. The details matter enormously because it is in places where parties wield disproportional power that democratic institutions are genuinely under attack. Take Hungary. 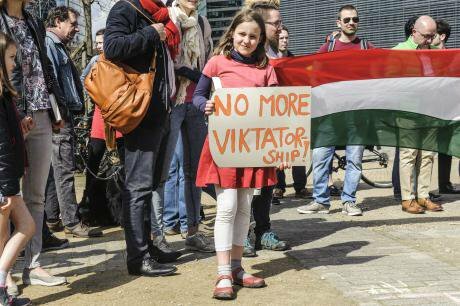 In 2010 Fidesz got 53% of the vote. But due to its disproportional voting system, the party won 68% of the seats in parliament - giving it the power to unilaterally rewrite the constitution. What does a party do when it’s given disproportionate power? It uses it to guarantee its own re-election. The party changed the electoral system to make it even more disproportional. As a result, in 2014 it won 67% of the seats with just 44% of the vote. In this year’s election the party retained its supermajority, again on a minority of the vote, and last month was accused by the European Parliament of undermining the rule of law as well as democratic norms. The Polish parliament – the Sejm – nominally uses a proportional voting system, but in practice, it is anything but. The Law and Justice Party won an outright majority at the last election on just 37.5% of the vote! Guess what? As well as granting themselves greater powers over the judiciary, the President has proposed changing the already unfair voting system to First Past the Post, which would be likely to hand even more disproportional power to the governing party. This phenomenon is not restricted to the former Eastern Bloc; it is happening in all three of the developed democracies that still use First Past the Post. Gerrymandering is endemic to America’s First Past the Post congressional elections, where representatives set their own district boundaries to make their re-election more likely. Legal challenges to rigged electoral maps are hindered by the appointment of unsympathetic judges, most recently by a President who was himself elected with three million fewer votes than the “losing” candidate. In June, Doug Ford - who has been called “Canada’s Donald Trump” - won an outright majority in the Parliament of Ontario with just 40.5% of the vote. Using this majority he moved to cut in half the number of representatives on Toronto’s city council in upcoming elections. When the courts ruled this move unconstitutional, he invoked an obscure power for the first time in Canadian history, allowing him to simply overrule the courts. Meanwhile, at the Federal level, Prime Minister Justin Trudeau quickly reneged on his cast iron promise to abolish First Past the Post after winning an outright majority with less than 40% of the vote in 2015. And in the UK, the Conservatives and DUP – who share a majority in Parliament with just 43% of the vote between them, are pushing ahead with changes to the constituency boundaries. These changes are predicted to hand the Conservatives a crushing electoral advantage – with projections suggesting they would win 40 more seats than Labour if both parties got exactly the same share of the vote. This should all come as no surprise. By definition, a political party is an organisation that seeks to accumulate power. When such an organisation gets hold of total power on a minority of the vote, it is in their very nature to use this power to retain their position. Rigging the democratic system is one of the most efficient ways to achieve this. There is only one legislature in Europe that both has a highly proportional voting system and in which the far right is in government: Austria’s National Council. With 27% of the vote (and 28% of the seats) the far-right Freedom Party are junior partners in a coalition with the centre-right. It’s an unwelcome thought for people on the left. However, because Austria uses Proportional Representation, the party would have to almost double its share of the vote before it could attempt the kind of partisan changes that are happening in Hungary or the United Kingdom. Indeed, the Freedom Party has been in government in Austria before (from 2000 to 2007) with no sign of the kind of attack on democracy that is routine among disproportional societies. Just as absolute power corrupts absolutely, disproportional power corrupts disproportionately. This is the real threat to liberal democracy. 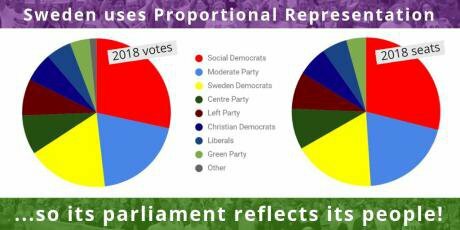 And it is why proportional systems like Sweden’s, in which seats match votes, are crucial to building and retaining fair democratic institutions. If you want seats to match votes in the UK, join Make Votes Matter: the movement for Proportional Representation.